Get down to brass tacks in our three sleek, inspiring main level meeting rooms. Clients and colleagues alike will be impressed by our combined 1,400 square feet of event space complete with high-speed WiFi, ergonomic chairs and cutting-edge equipment. In addition to all the high-tech essentials, we offer a full catering menu through our neighbor, Hearth & Dram. Breakfast burritos, anyone? 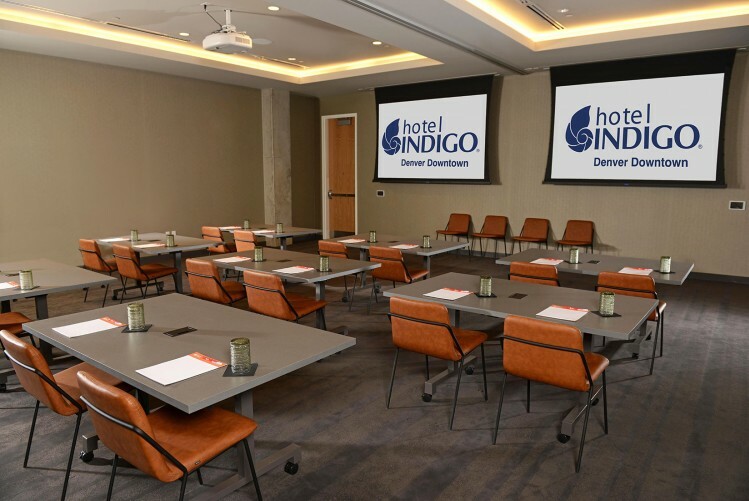 Ideal for executive meetings, our Hickenlooper Board Room measures 200 square feet and accommodates 6-8 guests conference or classroom-style and up to 20 theatre-style. Our identical Green and Russell Rooms measure 594 square feet and can be combined to accommodate up to 150 guests theater-style. When the work is done, or you simply need a break, our bustling neighborhood filled with bars, eateries, and artsy diversions, is waiting just outside. Now that’s the way to do business.